The hubby and I have been seeing a lot of short ribs being prepared on food shows lately and I have to say, I've been a little intrigued by them. I've never tasted or prepared them, so when we saw them marked down at the local grocery store, we snatched them up. 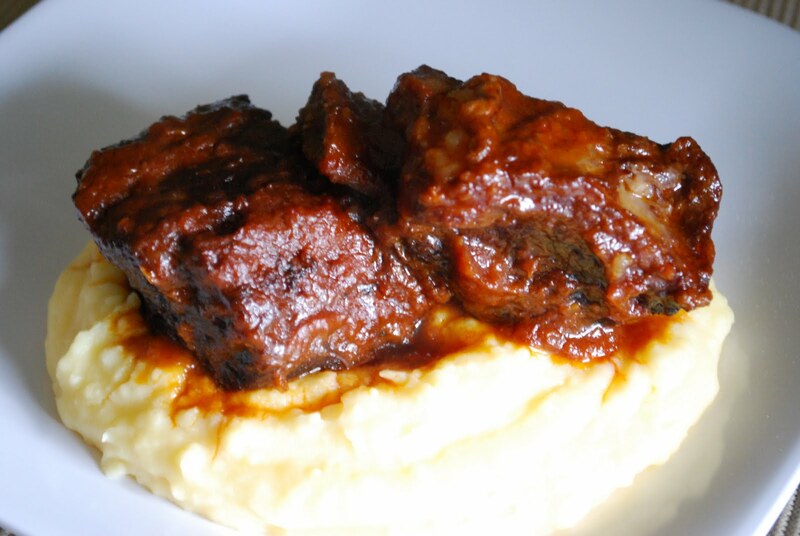 I remember seeing an episode on Food Network where Anne Burrell prepared some delicious looking short ribs, so off to the website I went. I was a little overwhelmed by the recipe, but I decided that I was going to follow through. I have to say, for the amount of time that I put into this meal, I was expecting a knock out dish, and I didn't get that. Maybe it was because it was due to the cut of meat or because braising is not my choice of method for cooking, but I just wasn't impressed. I'm one of those weirdos that likes a little bite to the meat, I don't like it so tender that it falls off the bone. (crazy, I know). The braising liquid was good, but extremely hearty. The hubby said it was "ok", so I didn't get a "OMG, you gotta make this again" scream; however, I had a great excuse to get out my Le Creuset pot and use it!! In fact, what we used to feel about particular rolex replica products, we now feel about brands - a sentiment that can rapidly change as new rolex replica products exceed or, in many instances, fail to meet our expectations. With watches, you have something a bit different. Kevin also replica watches uk discovered a concept that I have discussed for a few years now, and that is that timepieces are not trying to be the next big thing because they are, in fact, one of the "last big things." As major horological developments are replica watches uk mostly a thing of the past, there is little worry that your next luxury watch will become any more obsolete than replica watches it was when you bought it. We purchase timepieces for their quality and replica watches sale craftsmanship. Rose jovially explains that when one of his colleagues becomes curious about his fascination rolex replica with expensive watches, he simply shows them the case back of his A. Lange & replica watches Sohne or F.P. Journe watch and leaves it at that.